It’s that time of year again: Engineering week! 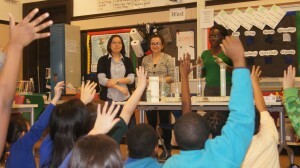 And UIC Chemical Engineers were lucky enough to spend another afternoon with Gretchen Brinza’s 4th graders at Chicago’s STEM Magnet Academy. Our budding young engineers learned how to use surfactants and catalytic reactions to make foams of various types with occasionally explosive results. Prof. Belinda Akpa, Prof. Randall Meyer and Prof. Vivek Sharma would like to thank ChemE Graduate students Jelena Dinic, Catalina Mogollon, and Subinuer Yilixati for joining us in sharing engineering concepts with a very enthusiastic bunch of students. 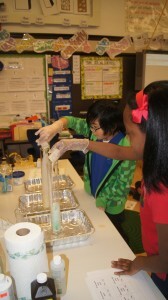 Posted in News and tagged Engineering Week, K-12, Outreach on February 19, 2014 by Belinda.